It’s the month of love! February is a perfect time to visit! One – there’s hardly anyone visiting Rainbow, and two – it is still summer. You can soak up the sunshine and relax on the sand, surf or horseride together or learn on a tour or 4WD or trek in some of Queensland’s most pristine National Parks. If you walk to Poona Lake, it is likely you’ll have it all to yourselves! Skip an extra day or so on the 14th and 15th and give yourselves a Valentine’s long weekend! Alternatively purchase a voucher from us for a Valentine gift you can enjoy when you both have time. I’ve had my mum and sister stay – mum enjoyed her coffees down the street, lunch at the Surf Club and drinks on the Deck at Sea Salt. Whilst she retreated to the pool and her book, Debbie walked me all over town – we did over 30 km in three days! 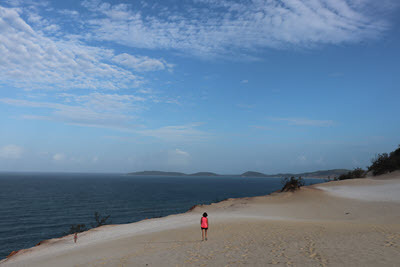 We trekked up to the Sandblow (the long way, where the track starts near National Parks Office). We walked to the cliff (pictured) then stopped for a drink with the sunset, took in a circuit nearly out to Inskip (not quite! ), boardwalks at Searys Creek – including exploring the entire creek and of course, down to our beautiful Coloured Sands. We even had the boogie boards out – it was lots of laughs catching them in together. The weather has been perfect whilst they were here and it still is fantastic, but we’d love to see more rain for the farmers.